This studio apartment is a great base for a couple wanting a holiday that mixes the Tuscan countryside with trips to the city of Florence. Recently renovated in comfortable, contemporary style, CIPRESSO studio is a fabulous find. Dating back to the 1500s, it offers a compact kitchenette, private bathroom and its own paved terrace and garden space. In the summer it is possble to relax in the shadow of the cyprus trees or stretch out to sunbathe. .
You’ll find memorable countryside to explore on the doorstep. Hilltop Nipozzano is a ten minutes away by foot. The timeless elegance of the Nipozzano Villa, country retreat of the noble Frescobaldi family, and the rugged Castello dating back to the year 1000, encapsulate the beauty and history of Tuscany. Borgo di Sopra is an ideal base in the beautiful Tuscan countryside for travelers who want to explore Tuscany and Florence. It is peaceful here. Overlooking gorgeous Chianti Rufina vineyards, it is difficult to believe we are just 30 minutes from central Florence. You wouldn’t even know that the busy town of Pontassieve is close by. Hop on a train from Pontassieve station and you will be in Florence in 25 minutes. You will need a car to stay here. To reach Borgo di Sopra you take the private vineyard road through the Castello di Nipozzano estate. (By the way, the historic Castle is within walking distance and well worth visiting – we can book you a tasting of their award-winning wines too). This is listing for BORGO DI SOPRA shows photos of three units; ANTICA (2-5 guests), VISTA (2 guests) and CIPRESSO (2 guests). All accommodations at Borgo di Sopra have their own private terrace with lovely views across the vineyards. Fittings are fresh and contemporary whilst in keeping with traditional Tuscan country style. Jane and her husband live onsite and are on hand to provide help with reservations, travel advice and wine tastings. The number of this multi-unit listing is 91933 and shows ANTICA (91933 unit 1082600), VISTA (91933 unit 1028547) and CIPRESSO (91933 unit 79314). I live at Borgo di Sopra with my family. I am English and my husband is Italian with a lifetime's knowledge of places to visit and eat throughout Tuscany. We are happy to share our knowledge with you and help you get the most out your holiday in this part of Italy. Can we offer you a glass of wine, spread out the map of Tuscany and help you draw up your itinerary? Borgo di Sopra is a fabulous mix. You truly feel away from it all, in the midst of a nature in a place of enormous beauty. There is lots of wildlife here, from deer to pheasants, hares, porcupines and all sorts of birdlife. Our apartments all look out onto the vineyards of the Castello di Nipozzano. These are cared for almost like a garden. It is wondeful to watch the passage of the seasons across them. Yet, if you get in your car and drive our bumpy stone road and then the leafy country lane, in 6 minutes you find yourself in the bustling town of Pontassieve. Restaurants and shops, banks and the train station - it all feels a world away from our Borgo and yet it is so close. At Borgo you can walk uphill to the lovely Castello di Nipozzano. There has been a castle here since 1000, and you can understand why. The position dominates the surrounding countryside. But there is also a handsome Villa from the 1700s. Its low key aristocratic elegance, charms and intrigues you into wandering into the wine store, perhaps even into booking a tasting. It is worth it. The wines are impressive and the laid back, welcoming style is uniquely Tuscan. Looking out across the impressive vineyards of the prestigious Chianti Rufina estate called CASTELLO DI NIPOZZANO. The Castle is within walking distance. The owners live onsite. We aim to avoid being intrusive but are always on hand for help and advice plus assistance with reservations. Absolutely beautiful place and Jane is an outstanding host ! I cannot recommend this place more ! Firstly we had a very disastrous start to our holiday, the hire car company didn't take debit cardswhen we went to pick up the car, we were devastated as we knew we needed this car to get to the villa. So there we were me and my girlfriend at 10 o'clock at night stranded after a days travel, I rang Jane the host not expected much more than "I'm sorry to hear but ...."
That didn't happen, Jane was absolutely lovely on the phone and emailed us with directions from the airport to the centre of Florence, where we would catch a train and meet her at the Pontassieve station. Bearing in mind this was very late at night I cannot overstate how Jane basically saved our holiday. After all of drama and we got to the villa it was beautiful, the pictures don't do it justice. There was a helpful guide in our room with suggestions of restaurants and places to visit nearby. The wine tasting at the Castle just above the villa was a highlight of the trip, a great location and was very welcoming of a complete wine novice such as myself. To sum up the hosts are lovely, the location is brilliant, a variety of things to do close-by and remember to correctly book when getting a hire car! We spent several days in the Cipresso apartment at Borgo di Sopra and could not have been happier with it. It is in a beautiful wooded area overlooking vineyards and the Val di Sieve. It is just a short train ride from Florence which saved us having to park our car in the city. The apartment was spotless, very comfortable and quiet and had everything we needed. The views from the terrace are a delight. Jane and Gianpiero were so warm and helpful, offering suggestions on travel,shopping and even how to pay the parking ticket we acquired earlier in our trip. They made our stay at Borgo di Sopra one of our favorite memories of our trip to Italy. If we return to the area we would definitely stay there again. Cipresso Apartment-What a way to relax!!!! Myself and my wife stayed for a week and found it delightful. 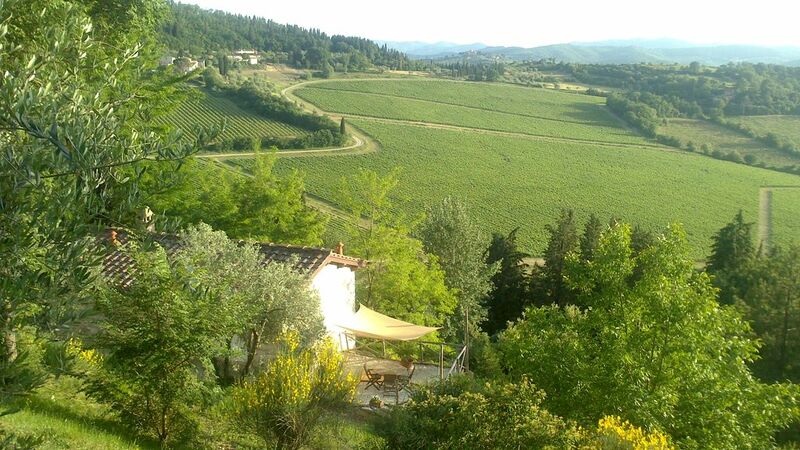 Set in the Chianti Hills above Ponttessieve near Florence we found it really relaxing. The welcome we received from Jane and Giampierre was fantastic. Nothing was too much trouble. The views were astounding and the apartment was spotless. The finish was beautiful- really inkeeping with the Italian Farm style. We had a great week and would recommend it to anyone. I had an excellent stay at Cipresso. My friend and I were staying in different places all over Italy and this was definitely one of the highlights of our trip. The apartment was pristine, it was so well maintained, it had everything we needed from a tea pot to a colander, to small reading lights by the beds. The terrace has an excellent view of vineyards and other beautiful properties that surround it. The town of Pontassieve was great to walk around, the locals were very nice, it was everything we hoped for. Jane was also an excellent hostess, she had information on trains going into Florence, where we could go grocery shopping, and winery tours at the castle that was just a 15 minute walk from her property. She was wonderful and her family charming. I would highly recommend staying here to anyone, it was beautiful, clean, homey, and relaxing. It would be perfect for a honeymoon, a vacation, really any kind of getaway or excuse for visiting. I hope to return to this lovely place someday! We stayed in the Cipresso studio in this newly renovated 15th century watchtower and found it to be the ideal place from which to explore Tuscany and Florence. The studio is of a decent size with a basic but useful kitchen. It's smaller than the Alba & Vista apartments (which we had a quick peek into while we were there, and which are probably better if you're looking at an extended stay of a few weeks/months), but suited the two of us perfectly for the week we were there. The studio's terrace has a wonderful view across the valley and over to the nearby hills; sitting here at dusk with a wine and antipasto bought from Pontassieve was pretty close to the highlight of our Italian trip. Pontassieve is about 5 or so minutes down the hill by car (it's 30 minutes on foot - we walked it a few times) and is about 20 minutes to Florence SMN by train. Sitting on top of the hill behind the property is the Nipozzano castle, part of the Frescobaldi family's winemaking 'empire' and a good place for winetasting. If you like walking, which we do, there are a number of small towns about an hour's walk from the property - we tramped over to Pelgao - with good eating and drinking when you get there. Jane & Gianpiero, the owners of the property, are lovely people and were extremely welcoming. We enjoyed their place so much that we extended our stay by two nights. I cannot recommend this property highly enough. If we ever go back to the area, this is where we staying. Wunderschöne Ferrienwohnung, idyllisch gelegen. Alles da, was man braucht. Tolle Ziele in der näheren Umgebung zum Wandern, Sightseeing in Florenz oder Essen in Pontassieve. Danke für die entspannte Woche! So glad you found the restful holiday you needed! Thank you for your kind words. The 2 main airports in Tuscany (Pisa and Florence) are easily accessible . Short breaks are feasible all year round! You'll know you have made an escape from routine, though, when you drive down the winding approach road. You pass through vineyards with a historic castle and our property above you in the distance. You are now in the Nipozzano estate of the noble Florentine family of Frescobaldi. From your apartment, a pleasant walk, with superb views, will take you up to the castle. There the wine is aged in the historic cellars and you can taste and buy all Frescobaldi wines. Numerous other panoramic walks dot the area (the historic monastery of Vallombrosa is not far either). For renaissance culture, we are near Florence and Arezzo. Regular trains from Pontassieve station (5 minutes away) to central Florence take only 20-25 minutes. Alternatively, designer outlet discounts from Gucci, YSL, Todds etc are to be found at the Mall, outside Leccio, 15 minutes away. All rates include utilities (water, electricity) and bed and bath linens for 2 people A 40% deposit is required to secure a booking, with the balance payable on or before arrival.